Types of Kits Available: What materials are XClutch Flywheels made from? This is application specific, but in most cases, the flywheel will be produced from 4140 Chromoly. This material offers exceptional weight savings and strength. XClutch also use very high quality QT450-10 Ductile Iron to produce flywheels. This material is high strength and provides a great surface area for mating with organic friction material. Depending on the style of twin plate, it is likely that the clutch will omit a “rattling” noise when the clutch pedal is depressed. This is due to the intermediate plate floating. XClutch has developed a range of 10.5” (263mm) twin plate kits for some applications where the intermediate plate is strap driven, stopping the intermediate from rattling when the clutch pedal is depressed. There can still be increased driveline noise when changing to most style of twin plates. 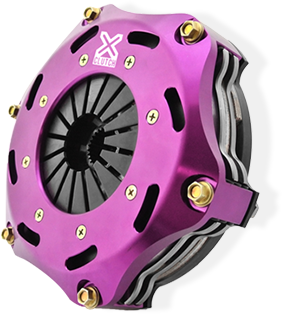 All XClutch kits are designed to be specific to the application. It is not likely that the clutch will cause more wear and tear on the gearbox but the type of driving that is done with the clutch can cause damage. Being overly aggressive with a stronger clutch could cause damage. Installation: Can I use an XClutch pressure plate with a flywheel from a different manufacturer? Depending on the clutch kit and flywheel application, you may be able to use an XClutch assembly with a different flywheel, however as some manufacturers use different designs for their pressure plate, it is vital to check this with XClutch first before ordering. Not necessarily. We always recommend inspecting (or upgrading when necessary) any components that may wear such as concentric slave cylinders etc. when replacing a clutch kit. Due to the labour involved with removing the gearbox, it can be good insurance to do these at the same time. XClutch commonly provide these components with their kits. In some cases, it is important to update the hydraulics when upgrading your clutch kit in order to make the clutch operate correctly. Installation: What clutch fluid do you recommend for use with an XClutch kit? It is best to check with the vehicle manufacturer what the recommended grade of fluid is for the hydraulic system. Some clutch systems share common brake and clutch reservoirs. In most cases, for street use, anything above Dot 3 is fine. In performance applications or where a common brake and clutch reservoir is used, a minimum of a Dot 4 or 5.1 should be considered. It is important that these are never mixed with any systems designed to utilise Dot 5 fluid and these fluids should never be mixed with Dot 5 fluid. It is also important to check the compatibility of these fluids with XClutch for your specific kit before using in the vehicle. Installation: Are spare parts available for XClutch products? In most cases it is possible to purchase individual components from XClutch. In multi plate applications, XClutch offers a range of discs and intermediate plates as individual components and it is also possible in some applications to upgrade your clutch to a higher specification.